Kidney stones are created when certain substances in urine — including calcium, oxalate, and sometimes uric acid — crystallize. These minerals and salts form crystals, which can then join together and form a kidney stone. Kidney stones usually form within the kidney, where urine collects before flowing into the ureter, the tube that leads to the bladder. Small kidney stones are able to pass out of the body in the urine — and may go completely unnoticed by you. But larger stones can irritate and stretch the ureter as they move toward the bladder, blocking the flow of urine and causing excruciating pain. Rarely, a stone can be too large to pass into the ureter and can remain lodged in the kidney. Why some people form kidney stones and others don’t is not always clear. Kidney stone disease is more common in young and middle-aged adults than in the elderly, and more prevalent in men than women. 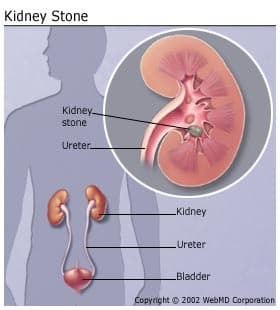 People living in hot climates are sometimes prone to kidney stones because they may become dehydrated more often than those in cooler climates, which concentrates the minerals in their urine and makes crystal formation easier. Medical evidence suggests that drinking too few fluids can increase the risk for forming kidney stones. Most urinary stones are composed of calcium oxalate crystals — a kind of salt in the urine that’s difficult to dissolve. Uric acid is a less common cause of stones. If your urine is chronically infected with certain organisms, you can be prone to getting different types of kidney stones as well. Certain people are frequent “stone formers.” A person who has one stone has a 50% chance of developing another stone over 10 years. Next Post Could Probiotics Help Prevent Fatty Liver Disease?